Encountering legal issues often leaves people consumed by confusion, anger, and frustration. 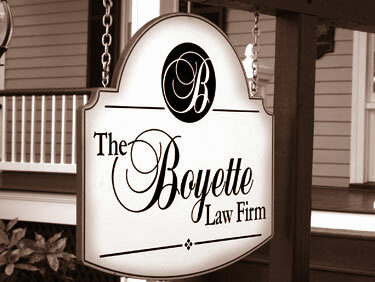 At the Boyette Law Firm we strive to help alleviate the stress and burden associated with resolving legal issues. 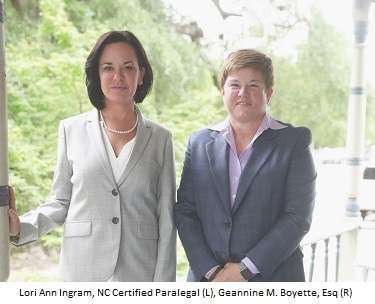 We maintain a client focused practice handling cases in the fields of family law, juvenile law, and criminal law. We understand that our clients look to the firm for advice and guidance as well as advocacy and support. We are firmly committed to providing our clients with the advice and information they need to make informed choices and to resolve their legal issues. You will play an integral role in assisting us to secure the best resolution possible and, as such, we will keep the lines of communication open from the start of your case until the matter is resolved in its entirety. You will receive individualized attention in recognition of the fact that no two cases are alike. It is important for you to know your rights and what alternatives are available to you. You will also need an advocate both inside and outside of the courtroom to ensure that your rights are being protected and The Boyette Law Firm will be a zealous advocate for your rights. "One of the things that is unique about our firm is that we remain sensitive to the fact that our clients are being asked to make decisions about important and often complex issues while under tremendous emotional distress. As a result, we are able to more effectively meet their needs." The Boyette Law Firm primarily practices in the fields of Domestic Law and Criminal Law, dealing with issues such as domestic violence protection orders, child custody and support, spousal support, property distribution, divorce and Grandparent’s rights, as well as DWI offenses and other traffic violations, drug related offenses, assault and property related crimes, for both juveniles and adults. The firm also assists individuals in their defense against the Department of Social Services. The practice areas of the firm include, but are not limited to, New Hanover, Pender, Brunswick, Bladen and Columbus counties.